The Capptions web modules are a one-stop place to view and manage all the authorized functions in your organization. The URL to access your organization will be http://organizationID.capptions.com. Your manager or system administrator can provide you your organization ID. Based on your organizational structure and hierarchy, you will have permissions to create, view only and/or manage observations and case files, inspections, actions and/or organization settings. To create a new observation click on 'RECORD ONE NOW'. For further detailed instruction on how to capture observations from this dashboard, click here. You can click on 'Start an inspection' to start filling a new inspections from a web browser. For more information, click here. Based on the authorization(s)/permission(s) you have, you will see some or all of the above. Manage actions : This is the dashboard to manage actions. If you have permission to manage functions in your organization, you can: view, create, assign, reassign, complete actions using this function. For more details refer to this Quick Guide. 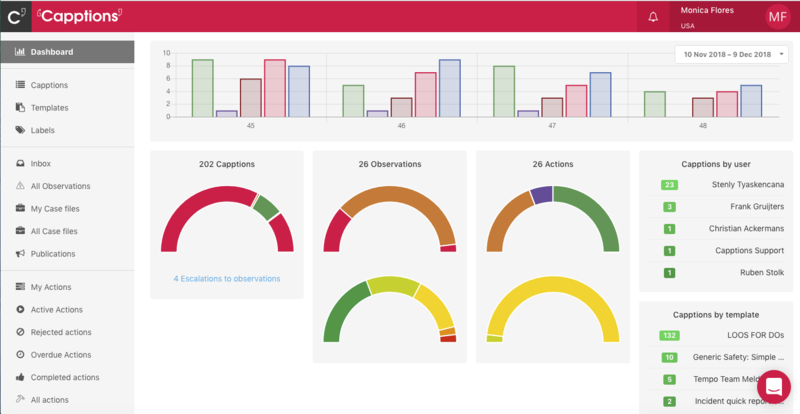 Manage observations: This is the dashboard to manage observations. If you have permission to manage observations in your organization, you can: view incoming observations, create, view and modify case files, initiate investigations. For more details refer to this Quick Guide. Manage inspections: This is the dashboard to manage inspections. If you have permission to manage inspections in your organization, you can: view completed inspections, create, view and modify templates, escalate to a case file. For more details refer to this Quick Guide. Organization settings: This is the dashboard to manage your organizational settings. If you have permission to manage your organization's settings, you're able to: create, modify or delete user accounts; manage permissions and authorizations; create and manage organizational hierarchy, locations, teams and functions. View reports: This is the reporting module. If you have permission to view reports in your organization, you can: view and create reports for your incoming data - inspections, observations, case files, enrichments etc. Capptions: Click on Capptions to be redirected to a new page where you will be able to conduct inspections, create observations and complete actions. These users can view all the activity, new observations, new case files, view actions, view inspections etc. Such users cannot perform any operation, but can only view. These permissions can be granted by the administrator of an organization.